RapVerse.com Community - Rappers, Emcees, Lyricists, HipHop Heads! Rappers, Emcees, Lyricists, HipHop Heads! FreestyleMadness.com - "The future of online entertainment!" BATTLE - CIPHER - CHAT - all 100% LIVE and in Real-Time. Literally there is nothing out there like this, it's the equivilent of going out to an open mic or a battle, but from home. 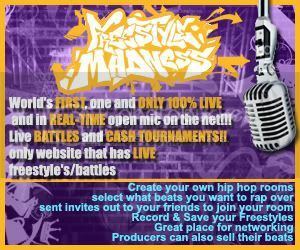 You can win cash from our monthly 32-64man mc battles, and you can also sell any product or music in our store and get 100% of the return. . . It's like a Music Store that's having a 24hour 7day a week, cipher and battle going. Free entry/signup. . . The only thing to top this is actually going to a club venue and spending time/money doing this on stage (which were also hosting club/event stuff too). Theres just no reason not to be a part of this site. Win cash from out daily tournaments (free signup) - Download new albums - Sell your beats and much more for free in our store. Get Paid To Spit Online. he's talking spitting bars. not wriring them.